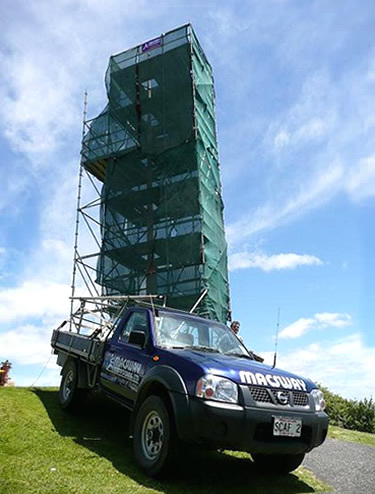 Macsway Scaffolding LTD is the premier provider of scaffolding in Rodney, through Northland, servicing the communities of Whangarei, Wellsford, Warkworth, Mangawhai, Maungaturoto, Kaiwaka, Tutukaka coast, Dargaville and the Bay of Islands. With 40 + years in the industry we are the innovators and the experienced scaffolders who can meet your needs for industrial, housing or for dry hire scaffolding. We began in 1969 in Ruakaka and run our day to day operations from our Kepa Road office. It is our mission to promote an environment of safety and professionalism in our scaffolding and rigging operations, which delivers excellent service and value to our clients. To live up to this mission, Macsway Scaffolding has led the way with safety innovation, training and testing. Through the use of Aculog Safety Management System to the NZ Certificate in Advanced Scaffolding held by our staff, to the joint formation of SARNZ, we live out this commitment. Give us a call and lets discuss your scaffolding needs. 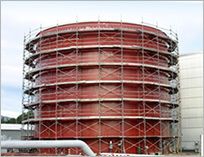 Macsway Scaffolding Whangarei, has been in the Scaffolding and Rigging business for nearly 40 years. It began at the NZ Refinery in the days when scaffolding equipment was manhandled on and off a trailer and hauled around by a Ferguson Tractor. Forklifts, Stillagers, Modular Systems, Alloy Mobiles, Handheld Radios, Computers and Hydraulic Cranes were the technology of the future.